No doubt, MSM spins, under reports, or blocks news that doesn’t fit the profile, and overplays or dramatizes news that does. But what profile? And at whose direction? This has been going on in the other arenas for years: it’s simply not possible for conservatives, political, social, or moral, to get honest coverage. Look at the last two presidential cycles! it’s hard to imagine how its results could have been much worse. Non-interest revenues were down 26% over prior year, including drops of 18% and 43% for its core business of investment banking and trading, respectively. Overall, total revenues plunged by 21% versus prior year, and net income dropped by a staggering 54%. Pretending that this is a “beat” is not only an insult to 9th grade intelligence, but actually emblematic of the institutional lying that has become built into the fabric of reporting. MSM embraced the Morgan Stanley and Alcoa creative accounting numbers; no questions asked. So who are these people who can’t see through transparent chicanery; don’t know the difference between GAAP and pro-forma; and are perfectly ok with buybacks (and addbacks) as a way to puff up P/E quotients? Charles D’Ambrosio pointed out in his short story “Loitering” that the women you hear on the airwaves are sorority girls who majored in journalism. Good point!
. . . they have no clue what is going on because they are merely paid actors. In England, they are called newsreaders for a reason. They read the news. They don’t make it and they don’t analyze it. Unfortunately, CNBC anchors speak with authority about things that they know nothing about. To be fair, editorial decisions on what to run and what to kill are often made a level or two above the “newsreaders”, but someone at the media outlets has a stake in painting rosy pictures of a world that is getting darker by the day. But what is the motivation? Is there a lecture in Journalism 101 at Northwestern that runs something like this? In the primitive forms of journalism practiced years ago, writers strove to stand aside and to present the facts as clearly and objectively as possible for a reader to draw his own conclusions. But now it is now understood that our practice must go beyond clinical presentation of information; the responsibility of each and every journalist, editor, and publisher extends to promoting “right thinking” in his readers. It goes without saying that Entertainment leans left; and it’s certainly safe to say that twenty something journalism majors (and sorority girls) tend not to be Young Republicans. So it’s not surprising that “correct thinking” as promoted by this group would be closer to Karl Marx than Adam Smith. Their work is not so much different than Winston Smith’s job at the Ministry of Truth: adjusting facts to the party line and putting Truth down the Memory Hole. One might have thought such dishonest behavior would have to coerced, but it seems to be something of a civic duty to protect the Proletariat from the truth in order to insure correct perceptions. George Orwell called it Groupthink. Nazis raised the technique to an art form as “incidents” led to the absorption of Austria; the destruction of Czechoslovakia; and in 1939 when a squad of corpses in Polish uniforms attacked a German radio station, the invasion of Poland. the longest streak of private-sector job creation in history . . . an unemployment rate cut in half . 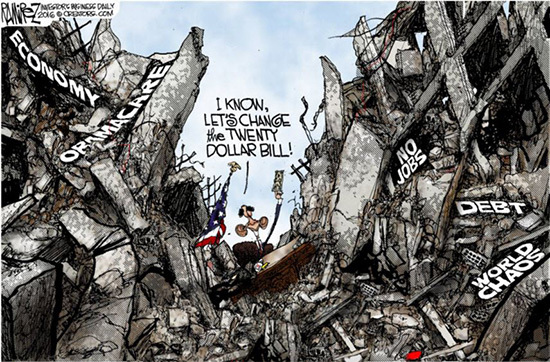 . . a manufacturing surge that’s created 900,000 new jobs . . . all while cutting deficits by almost three-quarters. Never mind half empty strip malls; small business throttled by regulation; employees not hired because of “Affordable Care”; Factory Orders down fifteen months in a row; six figure earners working at Walmart; baby boomers who will never retire . . . Shocking at first, but each communique makes it more clear the Administration intends to double down on this message. The economy is in terrible shape; no manipulation or intervention will fix it; elections are looming. So let’s put some lipstick on this pig! Herr Goebbels would be proud. History’s favorite megolomanic demagogue, Alexander of Macedon, had his moment when judgement failed. The great general was legendary for personal bravery; at all times single minded and aggressive in pursuit of his aims. So it was in 325 BC when campaigns led him to ancient Ariana, a region that has seen the death of aspirations for many great empires: England; Russia; America; others. The Mallians stood in the way of his efforts to subdue the Punjab and soon the Macedonians laid seige to the citidel at Multan where they held out. The fortifications were substantial, but his troops breached the outer wall and began to undermine the the inner citadel, but Alexander became frustrated at the pace. He took a ladder and scaled the wall himself. A few of his soldiers followed, but the rest begged him to come down, but he would not; instead he lept into the inner city by himself! And though he killed the leader of the Malli he was gravely wounded by an arrow that pierced his lung. His troops with a desperate, frantic effort joined him there. His men thought him dead but he was alive; barely alive. In antiquity no one survived such a wound, but Alexander did. But many say his constitution was ruined and two years later he succumbed to illness in Babylon and died. Did his unwise leap change the course of history? Maybe. Perhaps his empire would have lasted centuries, doing great things like the Persians he displaced; but maybe there was another Multan moment just around the corner. The realization of the expedition was a significant achievement: Sponsors had to be found; permission to visit this remote part of The Peoples Republic was hard to come by; everything had to align with the availability of the team; of the equipment; of the National Geographic film team. The pressure was on! Never mind the Tsangpo was flowing at three times the team’s expectations. Wick Walker’s book of the above title describes an inner fear held by every whitewater kayaker, and indeed, by every extreme sport athlete: that at some critical moment judgement can give way; that some rogue decision, superseding years of carefully honed discipline, will lead to disaster. So it was: Douglas Gordon died. Next: Alexander at the inner citadel of Multan. Failure is a complicated thing, becoming more so in the aftermath as the assignment of blame progresses! It was said by some, including Churchill himself, that Gallipoli was a failure of execution. And that was most certainly true: planning was inept; resources inadequate; the element of surprise was squandered. A case in point was the Royal Navy’s provision of minesweepers that were woefully ill-suited to their tasks; not strong enough even to contend with powerful currents in the straights. But beyond operational difficulties, the concept was spectacularly flawed: British warships were to sail straight up the Dardanelles to Constantinople and knock the Ottoman Empire out of the war. And that without ground forces; without consideration for powerful shore batteries; and with minimal concern for extensive minefields! So what if the fleet had steamed up into the sea of Marmara and arrived off of Constantinople. What would they have done there? The Turks, incapacitated by fear, would simply surrender their seven hundred year old empire to a few thousand British sailors? A moot point; for ships sank in the minefields or were incapacitated by shore batteries without making any impression on the Turkish defenses. The following amphibious campaign settled into a drawn out slogging match before the King’s forces reluctantly acknowledged ignominious defeat and slunk back to Britain. It was bad for Winston; the First Sea Lord lost his job and remained on the sidelines until he was made relevant again courtesy of Herr Hitler. Now the Prime Minister had a new enemy to intimidate in the Far East: the Japanese. He sent Force Z, a powerful naval squadron anchored by the powerful battleships Prince of Wales and Repulse, to Singapore. Surely Japanese resolve would collapse at the sight of these powerful representatives of the world’s greatest empire. Though the British themselves had administered a devastating blow to the Italian Navy at Taranto in the previous year with a handful of outmoded Fairey Swordfish torpedo bombers, they were oblivious to the need for air cover for their warships. The Japanese, unintimidated, replied to this British threat with their own air forces and sent both Prince of Wales and Repulse to the bottom. Again there were serious errors in execution, but a common denominator for both defeats was an underestimation of the enemy bordering on contempt, and a corresponding disregard for his capabilities. The loss of Singapore followed on the heels of the destruction of Force Z. Winston’s office survived these disasters, but in his memoirs he describes some agonized and sleepless nights! The Right Honorable Gentleman glowering at you on the right, Sir Winston Churchill, had a clarity of vision not granted to many. And he had courage to declare that vision in an overwhelmingly contrary environment. Neville Chamberlain returned from Munich to an ecstatic crowd, waving high his scrap of paper assuring “peace for our time”. 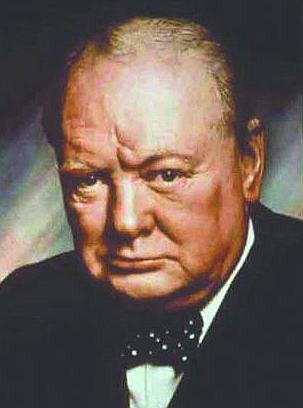 When Mr. Churchill addressed the House of Commons five days later, he stood alone: “We have sustained defeat without a war . . . the whole equilibrium of Europe has been deranged . . . this is only the beginning of the reckoning . . . the first foretaste of a bitter cup which will be preferred to us year by year. Events would soon show how profoundly and resoundingly right he was!! And how one might wish it were always so with Winston! But history has a way of bringing down the brilliant: despite his legendary strategic mastery Napoleon’s attack on Russia proved profoundly unwise; Robert E. Lee’s tactical genius deserted him at Gettysburg as he ordered a frontal assault against prepared positions on Cemetery Ridge. So Mr. Churchill had grievous encounters with fallibility. In fact the same flawed assumptions led him to disaster not once, but twice! I must compliment O! In four short years he has moved from merely incompetent to truly dangerous. For he is no friend of The Constitution of the United States of America. He identifies loopholes, technicalities, and ambiguities to exercise more power than the Spirit of that Hallowed Document would allow. While hapless constituents anesthetize on American Idol, Oprah, and Food Stamps, he chips away at the Separation of Powers with Executive Orders, Mandates, and Directives. Wake up America! Know Thine Enemy! – To ever larger and more ponderous government! – To printing presses unleashed to fund spending unrestrained! – To the victory of the entitled over the industrious! – Your leaders do not know history! – Your leaders do not understand economics! – Your leaders do not recognize human nature! – On grave of free enterprise! – On the grave of religious freedom! – On the graves of hard work and responsibility! Fill your pockets and Dance, America, while you march down the path that served the Soviets so very well in the last century! From a Josh Barro Bloomberg editorial. San Jose Mayor Chuck Reed, a Democrat, says that “irresponsible policy actions” have put San Jose in a bind. 1. Giving out raises faster than revenues were growing. 2. Giving out raises and increasing benefits when revenues were falling. 3. Giving out raises and benefits retroactively. 4. Allowing employees to cash out unlimited amounts of sick leave when they retire. 5. Providing lifetime health care for retirees. Sound familiar? In Chicago the Teachers Union is preparing to strike demanding a 30% pay increase over the next two years. It has been the pattern since the Teachers Unions have been able to strike: hold students children hostage year after year to obtain for themselves job benefits those of us who work in the private section can only dream about. Something to think about when you write your check for Property Tax that is nearly as much as your Mortgage.